Space and time for encounters with contemporary music creation, with focus on Portuguese new music, its composers and performers, within an essential affirmation of its vitality. 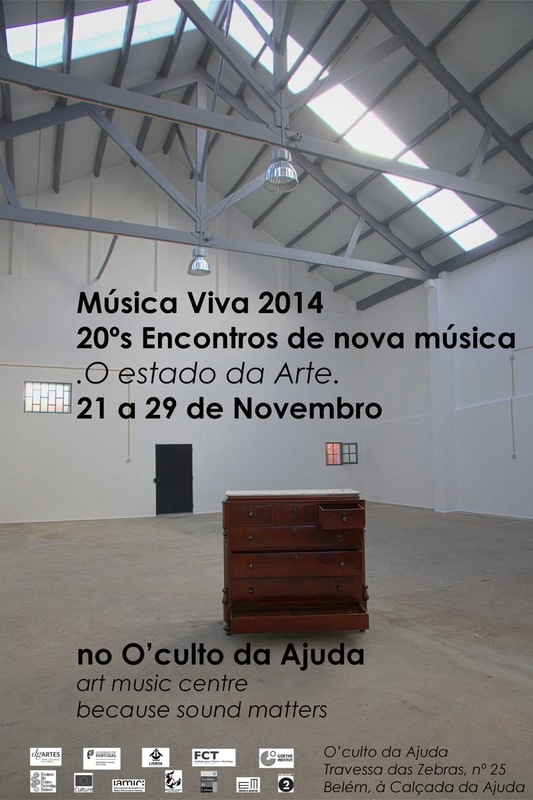 In 2014 the Música Viva Festival completes its 20thedition, in a new format and at a new venue, O'culto da Ajuda in Lisbon, uniting between November 21 and 29 a motivated and protecting assembly of the highest values of human condition and the art of music, created here and now, for a total understanding of what music is, today and since forever. With the presence of performers and composers of reference together with the newest generations, once again the Música Viva constitutes a platform of encounter and confrontation of ideas and aesthetics, to question, discuss and reflect on the State of the Art. 10h00 a.m. - 13h00 p.m. | 14h00 a.m. - 17h30 p.m.
6h00 p.m. - 11h00 p.m.
November 24, 6h00 p.m. - 11h00 p.m. The programme is subject to alterations.